"Scrooge Discovers the Reason for the Season"
THE MUPPET CHRISTMAS CAROL is a live-action musical that re-tells the classic Dickens story: Scrooge is beset by three ghosts who show him the past, present and future results of his greed and bitterness. As you may recall, the horror of Scrooge’s depravity causes him to repent of his selfishness, pray for God’s forgiveness and seek restitution with his fellow man. This spectacular biblical allegory unfolds with plenty of rib-tickling Muppet fun, sing-along choruses and a gentle reminder to love our neighbor. The story begins on December 24, 1843. As the day draws to a close, Ebenezer Scrooge (Michael Caine) says “Bah, humbug!” to Christmas dinner with his nephew Fred, scoffs at “Help the Homeless” solicitors, reminisces about evicting the orphanage who couldn’t pay their rent, and almost rejects his employees’ request for Christmas Day off. Even so, Scrooge’s overworked and underpaid staff, Bob Cratchit (Kermit the Frog) and the rat bookkeepers, are excited about the holidays. That night, Scrooge is awakened by the ghost of Jacob and Robert Marley, his deceased business partners. Floating above his bed in chains, they warn Scrooge that he will be haunted by three spirits: Past, Present and Future. Of course, fans of “The Muppet Show” will recognize the twosome as the elderly cynics from the balcony. They help to lighten the grim issues at hand and make things whimsical and imaginative, rather than frightening for children. Arriving first is the Ghost of Christmas Past, a fairy Muppet girl, who expresses a concern for Scrooge’s salvation. Taking him by the hand, Scrooge visits his childhood (with Rizzo the Rat and The Great Gonzo hanging onto his rope, acting as narrators for comic relief). As a youngster, Scrooge is an introverted loner who grows into a miserly adult. However, there is also great fun to be had: His boss (Fozzie the Bear) throws a Christmas bash orchestrated by the Swedish Chef, with singing grapes, horses and “Animal” playing the drums, along with the familiar Muppet Show band. Next, the jolly, redheaded Ghost of Christmas Present takes Scrooge to visit Bob Cratchit and his wife, Emily (Miss Piggy). As their family of amphibian sons and piglet daughters sit down to a meager dinner, they discuss their mortgage debt and the possibility of losing their home. Also needy is their handicapped son, Tiny Tim (who looks like Kermit). Interestingly, Tim returns from Church services, hoping to be a testimony that “God causes blind eyes to see and makes the lame to walk.” Also heartwarming is the song that calls upon God to bless all of them and lead them to Him. Lastly, the Ghost of Christmas Future is a shrouded figure without a face. He silently points to a group of Muppet pigs, Muppet cockroaches and a Muppet spider talking about Scrooge’s funeral. After visiting his tombstone, Scrooge is overcome with remorse and sadness. He repents of his selfish ways and vows to live upright, “starting every day with prayer and a thankful heart.” Awakening in bed, Scrooge happily sets out to celebrate Christmas, visiting all the people he wronged with his arms full of gifts. As the movie ends, the community sings of its newfound love and appreciation for one another. THE MUPPET CHRISTMAS CAROL is a unique presentation of the Gospel, transforming the age-old Dickens story with Muppet antics, finger-snapping musical numbers, breathtaking Victorian costumes, and winter scenery. Moms and Dads will also appreciate the filmmakers sensitivity to younger audiences, as potentially scary elements are brief and quickly turned around into a positive experience. The Ghost of Christmas Past, for instance, seems non-threatening (despite his grim reaper appearance) because he doesn’t say anything. One of the few non-Muppets in the film, Mr. Caine, offers a memorable performance as Scrooge. He really looks the part, with his curly locks, smirking mannerisms and British accent. All in all, THE MUPPET CHRISTMAS CAROL is the most uplifting holiday film of 1992. Scrooge’s “ghosts” of past, present, and future serve as plot devices to expose his egocentric lifestyle, and are therefore not necessarily occult. 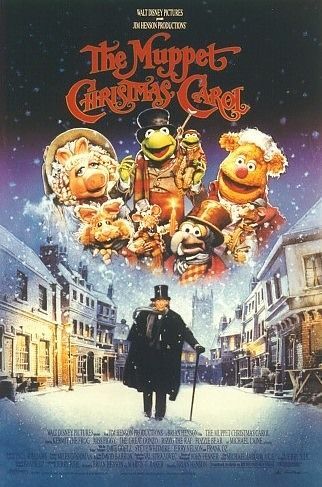 THE MUPPET CHRISTMAS CAROL is a live-action musical where the Muppets tell the classic Dickens story, with Michael Caine as Scrooge. Scrooge is beset by three ghosts who show him the past, present, and future results of his greed and bitterness. The two elderly grumps are back as Jacob and Robert Marley, Scrooge’s deceased partners. Also, Kermit and Miss Piggy play the happily married Bob and Emily Cratchit, with piglet daughters and froggie sons, including crippled Tiny Tim. Tiny Tim is part of the happy ending and mentions going to church as a testimony that God causes blind eyes to see and makes the lame to walk. THE MUPPET CHRISTMAS CAROL is a Christian, biblical allegory depicting a depraved man who repents of his selfishness, confesses his sinfulness, turns to God, and proceeds to walk in the Holy Spirit by showing kindness and generosity to everyone. It’s fun for the whole family, with plenty of finger-snapping musical numbers, breathtaking Victorian costumes, winter scenery, and surprise appearances by Muppet favorites. There’s plenty of fun to go around in this Christmas movie favorite!